Get ready for the best skillet frittata ever! Our Mushroom & Green Onion Skillet Frittata serves six in just 30 minutes and goes great with fresh fruit. Beat Neufchatel in large bowl with mixer until creamy. Add eggs, 1 at a time, mixing on low speed after each until blended. Stir in bacon, 3/4 cup mozzarella and onions. Spray 10-inch ovenproof nonstick skillet with cooking spray. Add mushrooms and garlic; cook and stir on medium heat 5 min. or until tender. Stir in Neufchatel cheese mixture until blended. Cover with lid. Reduce heat to low; cook 8 to 10 min. or until egg mixture is almost set in center. Uncover; place skillet in oven. Bake 5 min. or until center is set. Remove from oven. Top with remaining mozzarella; cover with lid. Let stand 2 min. Loosen frittata from side of skillet with spatula; slide frittata onto serving plate. Cut into wedges to serve. Substitute OSCAR MAYER Fully Cooked Bacon, chopped, for the crumbled cooked bacon. If you cook eggs often, invest in a good quality skillet. Choose one that is heavy and has a nonstick finish. An 8-inch nonstick skillet is perfect for omelets. 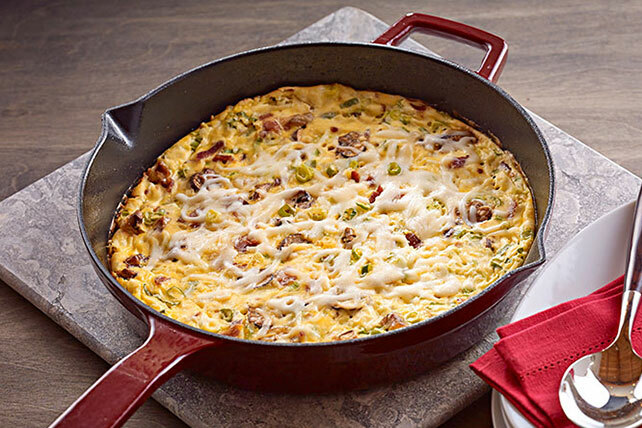 A 10-inch nonstick skillet is great for frittatas, scrambled eggs and other skillet eggs.